Arsenal eyeing bid for City shot-stopper as Szczesny replacement. 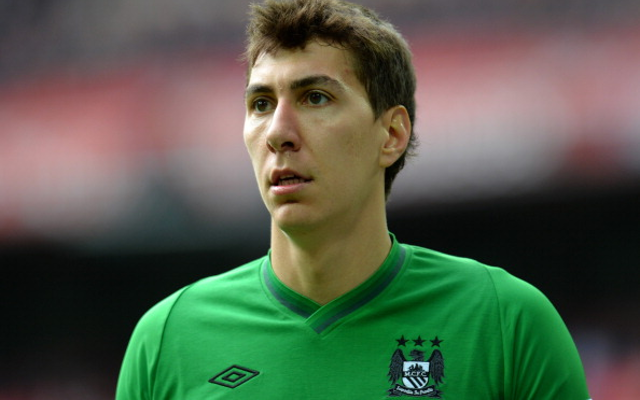 The Daily Mirror claims that Arsenal are looking at a number of goalkeepers to replace Wojciech Szczesny this summer, one of them being Manchester City backup ‘keeper Costel Pantilimon. Julio Cesar of Queens Park Rangers is also linked, with the former Inter Milan player one of many big names likely to leave Loftus Road if the club are relegated. However, it is thought that Arsene Wenger will look to lure away Pantilimon, who wants more first-team football, but who is unlikely to find it at the Etihad Stadium due to being behind England star Joe Hart in the pecking order. The 26-year-old has played mostly in the FA Cup for Roberto Mancini’s side this season, recently impressing in the semi-final win over Chelsea, and Wenger may feel he would be a slightly cheaper option than some of the other names the club have been linked with. Since dropping Szczesny to the bench for Lukasz Fabianski, Arsenal have been linked with a whole host of goalkeepers: Asmir Begovic, Simon Mignolet, Victor Valdes, Michel Vorm, Tim Krul, and a few others. QPR’s Cesar has had a strong season for Harry Redknapp’s side, even though the club are almost certain to go down, and would surely be available when they clear out of some of their higher earners over the summer. However, at 33 years of age, Wenger might feel he could do with a more long-term option than the Brazilian.